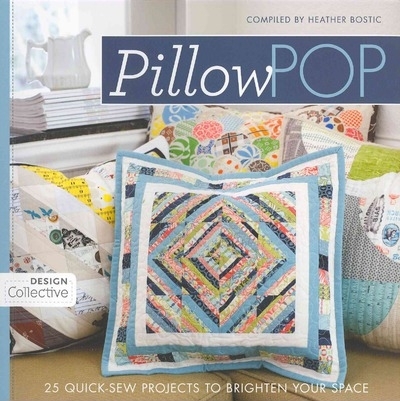 One of my favorite craft books at the moment is Pillow Pop. I have previously made a pillow from it – Sea Spray. When the brown bag challenge came up in our guild, and I pulled these two fabrics, I decided I would make another one from the book. You can check out the rest of the challenge rules here. The is” The Metro” pillow pattern. I love how it turned out. I still think this bicycle fabric is fabulous. 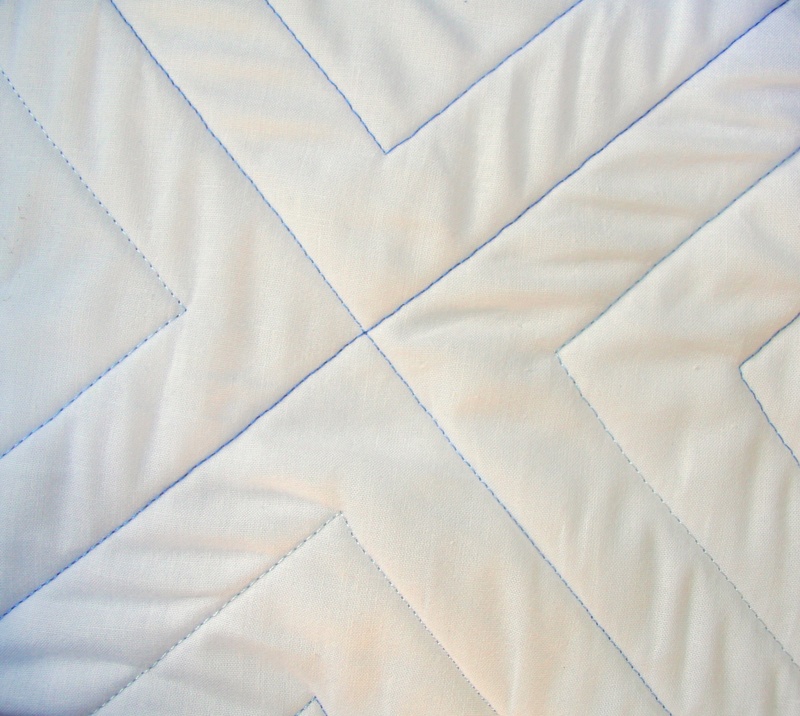 I did some straight line quilting in a triangular pattern in each quarter. I used chalk to mark the diagonals and then the center lines as a guide, and then sewed 1″ lines using my walking foot and guide (to ensure the 1″ distance). I also decided to try out some variegated thread in blue tones. I really liked it and will be using it again on some future projects. You can see the color changes a little more clearly here. One final view of the pillow, in use, in our backyard. 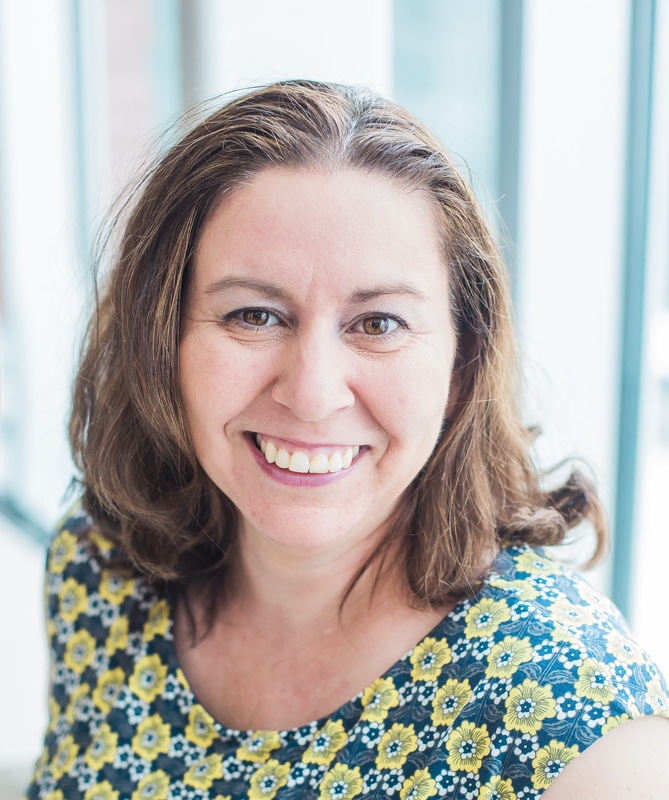 It is a lovely fall day here, so a perfect opportunity for some photos. This month is Craft book month @ Craftbuds.com, where they are running a link up when you post about your favorite craft book and project from that book. This entry was posted in Uncategorized and tagged craft book, Craft book month, cushion, cushion cover, patchwork, pillow, pillow cover, Pillow pop, quilting, sewing, TMQG brown bag challenge, variegated thread on September 29, 2013 by mlwilkie. Thanks, I thought the triangles would break it up some – it was either that or straight lines and I wanted to try something different. What guide do you use for your quilting? On my walking foot I have a “stick” thing (quilt guide) that goes through a hole at the back and if I put it on the 1 inch mark on the plate, I can then use it to follow the diagonal mark to start and then each line after I have it along the last line stitched. The only thing I am weary of is checking at the start of each line it is where it is suppose to be. The finished cushion looks great! I know I mentioned this before, but I love that you incorporated the red part of that print . I really like this, the bikes really make it stand out. Thanks for sharing. It looks beautiful, Michelle! 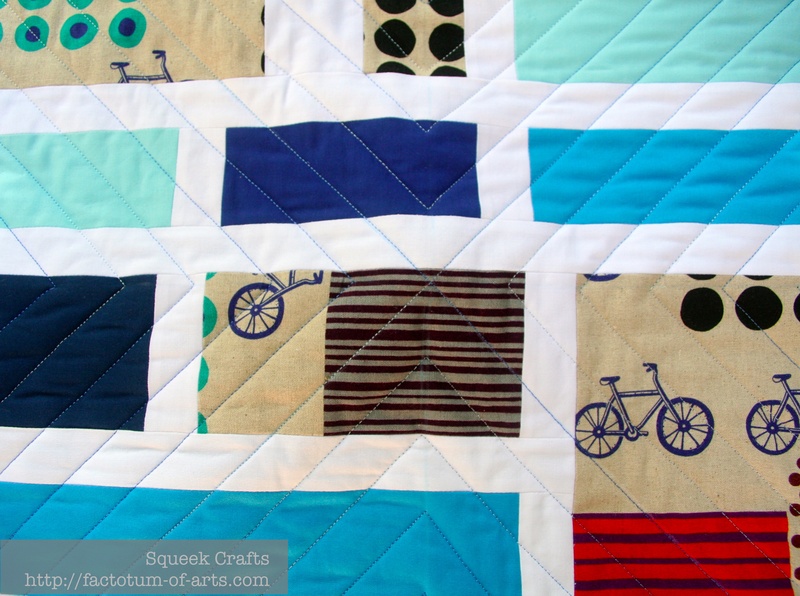 I really like the quilting and the thread choice, and I liked seeing the quilted variegated thread up close. Thank you Daisy, I do like the final quilting on it. 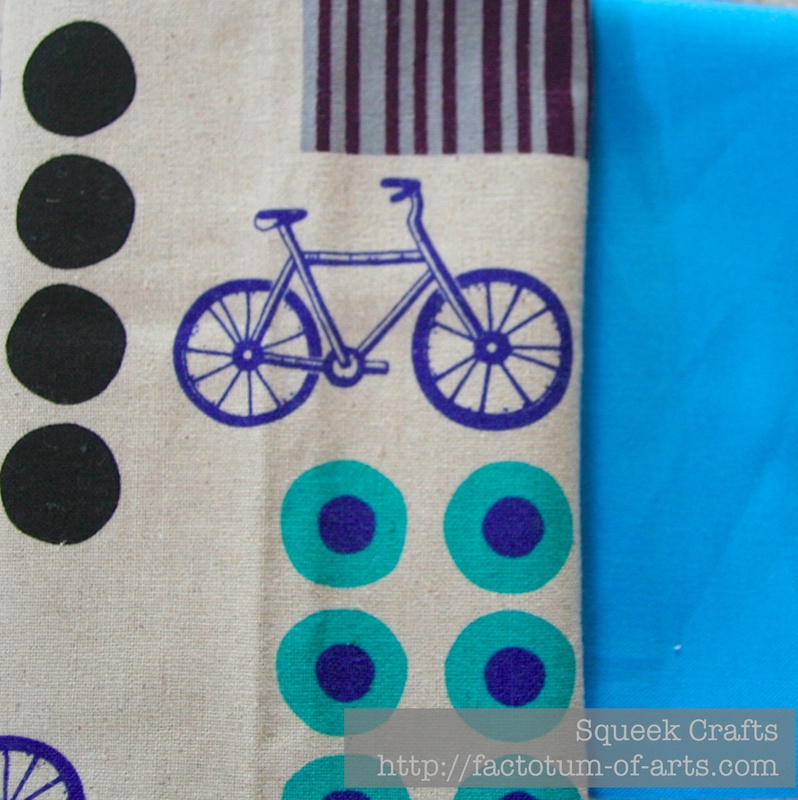 I have some left over fabric of the bicycle print, so I thinking of another small project. 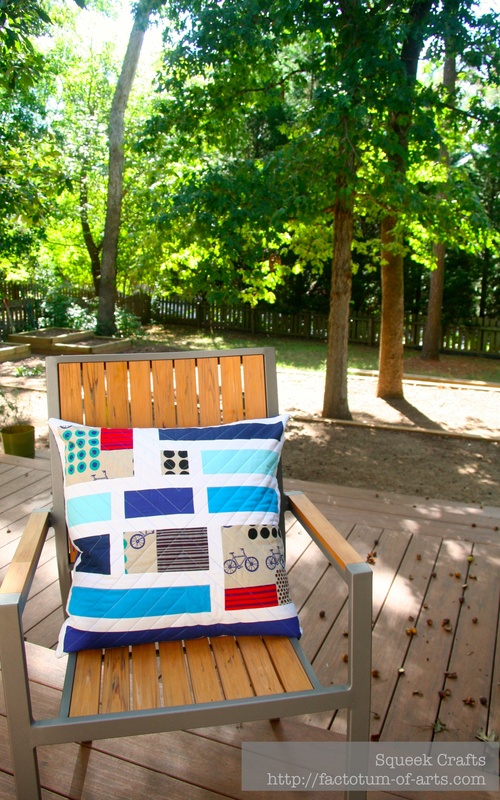 Fabulous pillow – love the bike fabric as well! This definitely caught my eye, with that little bit of red to set it off so well. 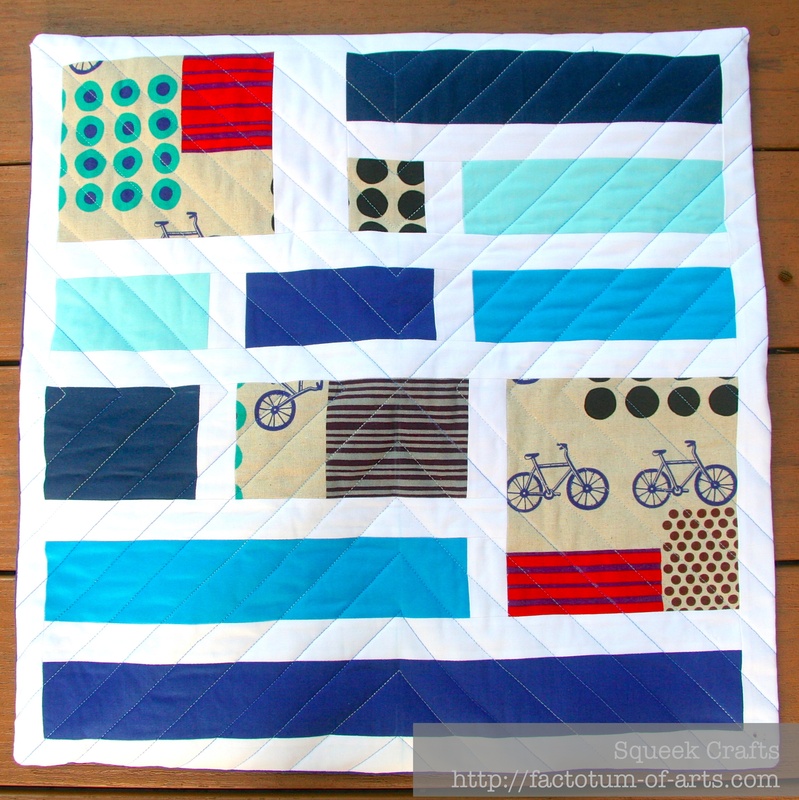 I love your design and the quilting. Variegated threads are my favourite too 🙂 I can’t stop making cushions at the moment!